There’s only one brand of sunscreen I use, Babo Botanicals. They are one of few that uses only non-nano zinc oxide as the active ingredient. Even other natural sunscreens use known carcinogens, so I always stick with this brand. 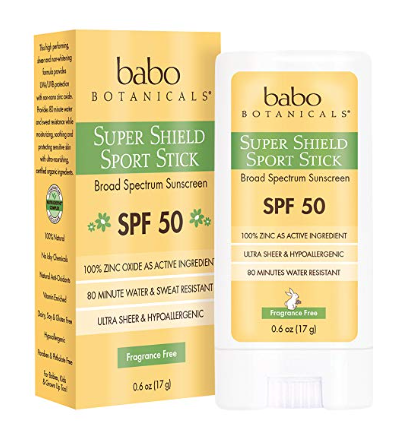 Amazon has an amazing deal on Babo Botanicals Natural Sport Stick fragrance free sunscreen. I use this exact product and it’s my favorite way to apply sunscreen, especially on my kids. It goes on smoothly and quickly. The cream takes a bit to rub it in completely, where the stick rubs in easily. You can either grab two Babo Botanicals sunscreen sticks for $3.43 ($1.72 each) when you clip the 15% off coupon under the price (states it will ship in 1-4 weeks, order now to guarantee the price). Or, grab one stick for as low as $1.72 after the 15% Subscribe and Save discount. This is what I ordered. This same Babo Botanicals sunscreen stick sells for $5.49 at Target, so this is a hot price! Hurry! Reader Kristin ordered hers from the last deal I posted and already received it. The expiration on hers isn’t until 6/2020, so you should be able to stock up! PreviousPrevious post:$6 off 5 Select Prime Pantry Products (tons of organics) plus FREE shipping $35+NextNext post:*RARE* 2 New Seventh Generation Coupons- Print Now!